With Activison’s involvement of the Spider-Man license now limited to the increasingly poor movies, the rights to create games based on the Spidey comic books have found a new home at renowned mobile developer Gameloft. Fans should rejoice – a change of hands has done wonders for the iconic character. It’s exactly what the license needed, and something that has been a long time coming. So long, in fact, that we can’t even remember who owned the Spider-Man license before Activision. Foremost, those expecting something similar to Activision’s open-world adventures should curb their enthusiasm. This is an objective-based auto-runner with very simplistic controls. That’s the reason why it works so well though – they’re incredibly intuitive, with just simple swipes of the screen required to manoeuvre the Spidey with both speed and grace. 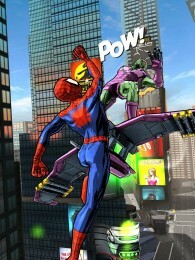 Enemies with shields are defeated by swiping down, prompting Spidey to slide into their nether regions, while airborne foes are attacked by swiping up. Web-swinging meanwhile is handled by pressing the screen for a couple of seconds between swings. The only thing that doesn’t work all that well is wall climbing, which relies on finicky tilt controls. Thankfully, wall climbing sections aren’t too common. The plot sees Spider-Man out to stop the Sinister Six from fully opening an Avengers-style intergalactic portal currently looming above the city. Fortunately Spidey isn’t alone in this quest, able to recruit fellow Spider-Men from other spider-verse dimensions. These are summoned at random (and vary in rarity) by using canisters collecting during the dazzlingly colourful levels. Nick Fury lends a hand as well, showing up during the brief but stylish cutscenes to explain mission objectives and detail what the enemy is up to next. Fury’s dry wit combined with Spider-Man’s snappy one liners make for much amusement. Black Cat and others provide additional side-missions, such as breaking into Oscorp to steal medical supplies for the wounded.